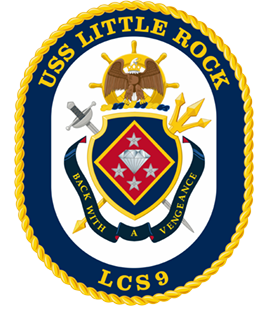 It has been four-and-half months since the new USS Little Rock (LCS 9) was commissioned in Buffalo, New York. Although LCS 9 and her crew were forced to winter-over in Montreal, Canada due to ice in the St. Lawrence Seaway, the ship finally arrived in Mayport Station, Florida last month concluding her Commissioning journey. To signify the conclusion of the Commissioning chapter in the life of the ship, members of the USS Little Rock (LCS 9) Namesake Committee received honorary plankowner plaques during a visit Wednesday May 2nd and May 3rd by Maurice L. “Moe” Naylon III and Daniel Mecca, chairman and vice-chairman, respectively, of the USS Little Rock (LCS 9) Commissioning Committee. 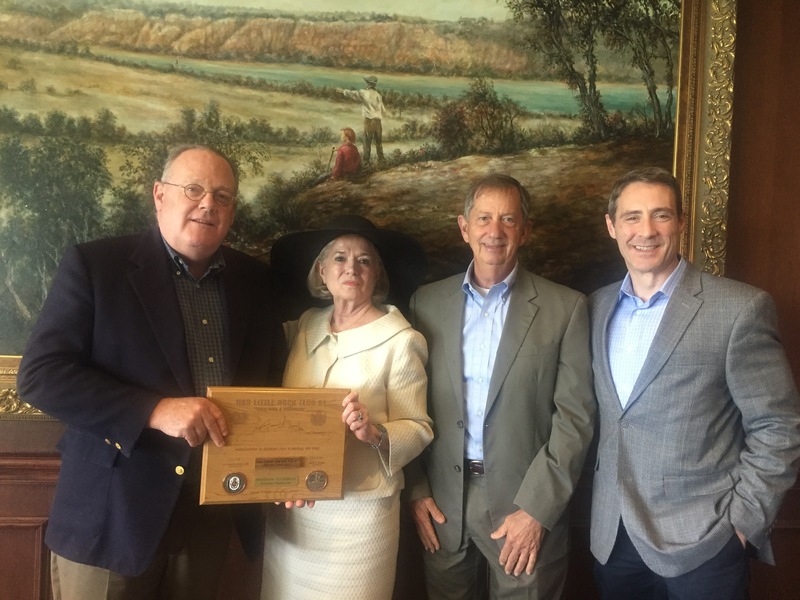 The pair traveled to Little Rock to present the plaques to members of the Namesake Committee, formed by Little Rock Mayor, the Honorable Mark Stodola, to work with the Commissioning Committee and represent the City of Little Rock for the historic ship commissioning. A Plankowner is the designation given to the original members of a newly commissioned US Navy warship. Honorary Plankowners are those individuals who played a significant role in the commissioning of the new ship but are not members of the crew. Each new ship has a custom-designed plankowner plaque. The USS Little Rock (LCS 9) plankowner plaques were created at design firm Abbey Mecca & Company by Buffalo artist Paul Maurer. Maurer selected a wood base plaque that features a silhouette of LCS 9 and seals of the cities of Little Rock and Buffalo. The plaques also feature insets of official commissioning coins. Each LCS 9 plankowner plaque includes a piece of original teak decking taken from the first USS Little Rock, now on permanent display in Buffalo at the Buffalo & Erie County Naval and Military Park. The commissioning of LCS 9 on December 16, 2017 drew more than 8500 people and marked the first time in US Navy history that new Navy warship was commissioned alongside her namesake. While the presentation of the Honorary Plankowner plaques marks the end of the primary mission of the Namesake and Commissioning Committees, the Committee members will continue to work together. Special funds were established by the Committees that will provide scholarships to students in Little Rock and Buffalo that wish to purse studies in science, technology, engineering, and math in college.